Decoupling is one of the prominent mantras in software engineering. 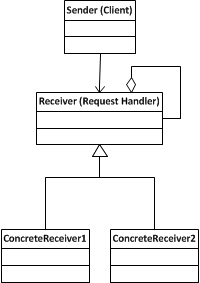 Chain of responsibility helps to decouple sender of a request and receiver of the request with some trade-offs. 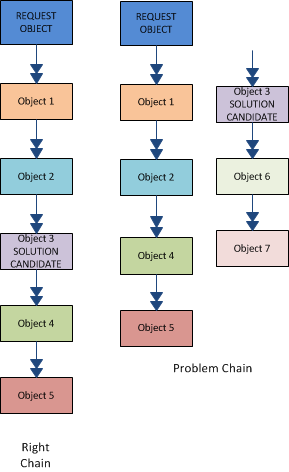 Chain of responsibility is a design pattern where a sender sends a request to a chain of objects, where the objects in the chain decide themselves who to honor the request. 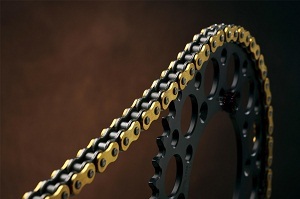 If an object in the chain decides not to serve the request, it forwards the request to the next object in the chain. Responsibility is outsourced. In a chain of objects, the responsibility of deciding who to serve the request is left to the objects participating in the chains. It is similar to ‘passing the question in a quiz scenario’. When the quiz master asks a question to a person, if he doesn’t knows the answer, he passes the question to next person and so on. When one person answers the question, the passing flow stops. Sometimes, the passing might reach the last person and still nobody gives the answer. Welcome to behavioral design patterns. This is the first tutorial in behavioral category of our famous design pattern series. There may be scenarios where a node is capable of solving the request but may not get a chance for it. 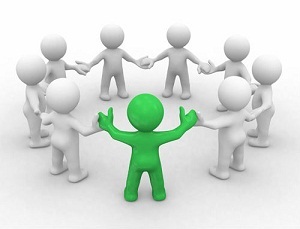 Though there is a candidate who can solve the problem, but since nobody forwarded the request to it, it was not given a chance to serve and final result is the request goes unattended failure. This happens because of improper chain sequence. A chain sequence may not be suitable for all scenarios. In object oriented design generally, every object is responsible for all its behaviour. Behaviour of an object is not transferred to other objects and is enclosed within itself. In chain of responsibility, some percentage of behaviour is offloaded to third party objects. When thinking about nice examples for chain of responsibility pattern following list came to my mind. Coin sorting machine, ATM money dispenser, Servlet Filter and finally java’s own Exception Handling mechanism. We know exception handling better than anybody else and we are daily living with it. This qualifies as the best example for chain of responsibility. We may have sequence of exceptions listed in catch statements and when there is an exception thrown, the catch list is scanned one by one from top. If first exception in catch can handle it the job is done, else the responsibility is moved to next in line and so on till it reaches finally block if we have one. Following example code gives a sample implementation of chain of responsibility. This is the interface that acts as a chain link. This class is the request object. This class is a link in chain series. This class is another link in chain series. This class configures the chain of responsibility and executes it. Comments on "Chain of Responsibility Design Pattern"
excellent and makes very easy to understand the concept, tnx a lot. Thanks Joe for this blog…very well explained. well explained. Thank you. Did not get what logic used for Coin sorting machine, ATM money dispenser? @Irshad: Say if you want to withdraw 2200 Rs, and ATM has 1000, 500 and 100 rupee notes. As per chain of responsibility the request would be sent to object that dispenses 1000 rs note. If 1000 ruppee notes are NOT available then it would be sent to an object that dispenses 500 rs note. The 500Rs object decides to dispense 4 notes and then 100 rs object would be asked to handle the rest. Advantage is, eventhough there are no 1000 rs not avaialble, your req would be still handled by other objects like 500 and 100. But in ATM when we withdraw 1000 then is in form of one 500 notes and rest are 100 note. It would be better if you put the search box , which is right now in the bottom of the page to above on inside “Stay in touch” box. It will make more easy to search content on your page. Here ATM software has been made to implement a customized form of Chain of Responsibility for ATM user convenience. So if you were to withdraw Rs 1000, the first Rs 500 is mandated to be served by the 100 dispenser. Then the balance 500 will follow the Chain of Responsibility pattern. geting the clear understanding on chain of responsibility …. @Irshad: The example i’ve used it for pure illustration purpose to explain application of CoR. In reality, dispenser uses the Chain of responsiblity design pattern along with certain BUSINESS RULES in order to use the notes optimally. Infact what you have pointed out, is an advantage of CoR as it is FLEXIBLE and CUSTOMIZABLE. its really intresting ,easy, understandable iam so happy for your blog …. Could you please explain JVM “Runtime Data Areas” in a Nut Shell. could you please tell me, is there any hierarchy we need to follow for learning design patterns. like first this pattern should learn after that this one like that any hierarchy is there? A very good article that helps me understand so obscure concept! Thanks, Joe! Just little question is what is the difference between this design approach and traditional if else approach? Can you help me to understand it more deeply. Super clear, Joe. Thanks, it may be useful for a problem I’m encountering!!! Your blog will be my first source in this topic. Your explanations are very clarifying. too good continue ur explanations. I’m impressed. Your every design pattern I perused. How about you go ahead and explain all the GoF design patterns? I prefer to use chain like the code above this way my code is easier to read each handle method just worries about how to handle and not worry about conditions if its eligible to handle can this also be called chain of responsibility? Excellent article… I have one question.. Is Interceptors in struts2 uses chain of responsibility design pattern? chain of responsibility with decorator pattern. where responsibility is shared in a modified manner. excellent and very easy to understand the concept, thanks a lot. Really Superb. You made us to understand the concept of design pattern, which everyone feels difficult… Really great.. Comments are closed for "Chain of Responsibility Design Pattern".